Recover Deleted iMessages on iPhone? Solved! Today there are an increasing number of people who are willing to use iMessages app on iPhone to communicate with others. Compared with the traditional SMS instant messages, iMessages is fully compatible with Wi-Fi network, and convey not only text messages, but also pictures, videos, and voice messages for free. Besides, these iMessage threads on your iPhone can be synchronized to your other Apple devices, such as iPad, iPod and Mac, so you can view them anytime anywhere. However, with the frequent use of iMessages, the possibility of losing them will be greater. What would you do if your important iMessages threads were gone, just like Sam? In this article, we will provide you with 4 possible solutions to recover deleted iMessage on iPhone effectively. Unluckily, you lost your iMessages, and what's worse, you didn't back up your iPhone data before, now the only way to retrieve deleted or lost iMessages is to ask a third-party data recovery tool for help, such as Joyoshare iPhone Data Recovery. Joyoshare iPhone Data Recovery is a powerful and trusty ultility that can salvage up to 20+ types of lost data including iMessages, SMS, contacts, videos, pictures, notes, call history, WhatsApp/Kik/Viber messages and attachments, etc. on iPhone, iPad and iPod touch. With the support for three smart recovery modes, users can restore almost all data without or from backup in a high success rate. Besides, users can also preview the iMessages before recovery and then only recover the items they needed selectively. 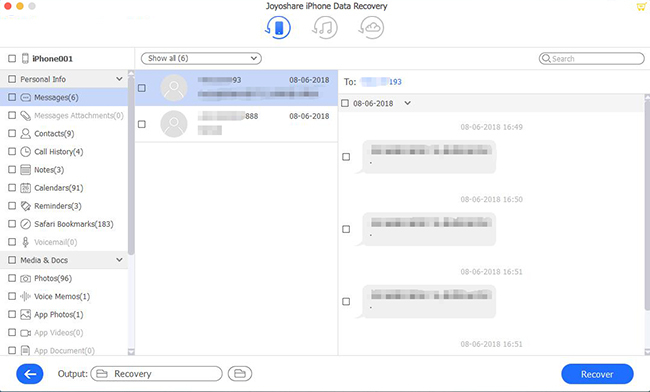 Next we're going to tell you how to recover deleted iMessages on iPhone without backup by adopting this reliable Joyoshare iPhone Data Recovery. The app is available for both Mac and Windows version, and here we take Mac version as an example. First of all, please connect your iOS device to the Mac with an original USB cable. 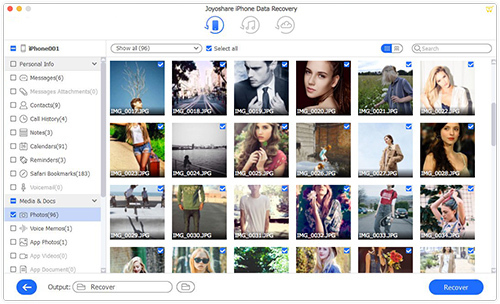 Then launch Joyoshare iPhone Data Recovery program on the desktop screen after downloading Joyoshare app. And it will detect your phone automatically. 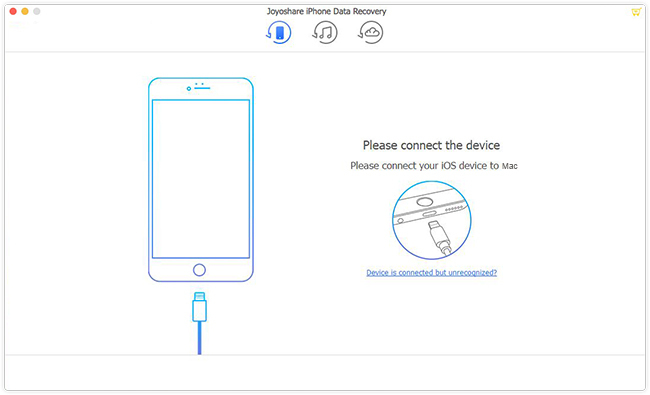 After Joyoshare recognized your device smoothly, it will enter the mode of "Recover from iDevice" by fault. Next choose the file types you want to recover such as "Messages & Attachments", and then click the "Scan" button to let Joyoshare scan the deleted or lost messages and attachments. 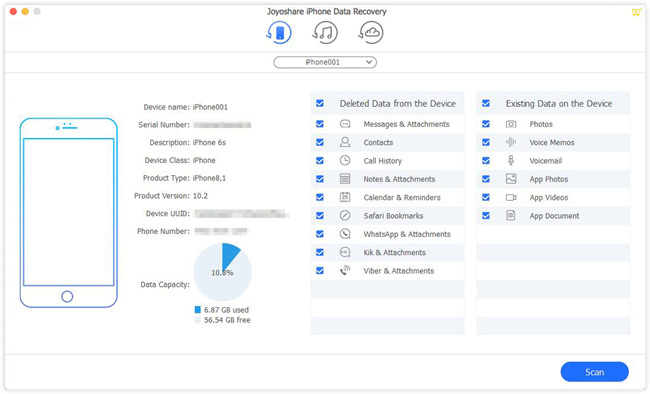 Note: If you have an iTunes or iCloud backup that may contain the lost iMessages you need, you can also use Joyoshare iPhone Data Recovery to recover deleted iMessages on iPhone from iTunes backup or iCloud backup by switching to the "Recover from iTunes" or "Recover from iCloud" mode, without replacing the exisiting data on your iPhone. After the scanning is finished, you can see all recoverable messages and its attachments listed in categories. Now it's your time to preview these items and find the required ones. You can also search a keyword on the search box to look for a specific message thread, or click the "Only show the deleted" filter. Afterwards, click the "Recover" button and export the selected iMessages to the local folder of your computer. 3. Pick the most relevant iTunes backup file and then click the "Restore" button. Wait a while and you'll find your lost iMessages on the phone. Note: 1. Do not disconnect your device with computer until the restoring is completed. 2. 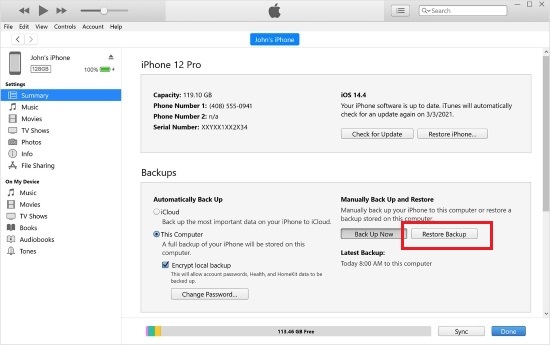 After restoring iTunes backup, the file will overwrite all the current data on your iPhone. 3. Enter Apple ID and passcode to log into your iCloud account. 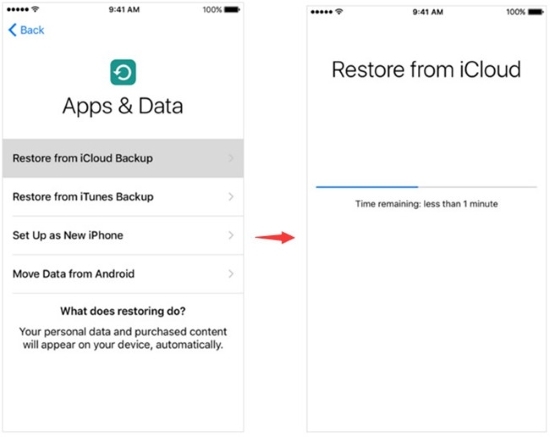 Then select an iCloud backup that may contain the lost iMessages you need, and start to restore. Wait a few minutes till the restoring process ends. Note: By adopting this method, you need to erase all your data on the device. We suggest you should back up your existing data before losing them. If you have other Apple devices such as iPad, iPod or even Mac, it is possible for you to bring the lost iMessages back from these devices. Apple has offered a feature that all the iMessages are automatically snyced among these devices as long as they're authorized with the same Apple ID. Now you can simply go to your other devices to check if your deleted iMessages still exist on your iPad, iPod or Mac. How Can I Recover MMS from iPhone?